Stephen J. Chapman is a leading author in the area of machines. He brings his expertise to the table again in An "Introduction to Electric Machinery and Power Systems." 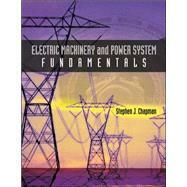 This text is designed to be used in a course that combines machinery and power systems into one semester. Chapman's new book is designed to be flexible and allow instructors to choose chapters "a la carte", sot he instructor controls the emphasis. Chapman has written a book that give students what they need to know to be real-world engineers. It focuses on principles and teaches students how to use information as opposed to do a lot of calculations that would rarely be done by a practicing engineer. He compresses the material by focusing on its essence, underlying principles. Matlab is used throughout the book in examples and problems.